Aspect Hotel Park West is located on the grounds of Park West Business Park in Nangor Road, Dublin 12, this modern hotel is a 3-minute walk from trains with service to Dublin city centre. It's 3.3 km from the M50 motorway. 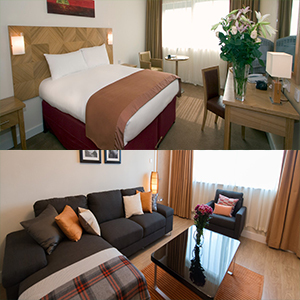 Aspect Hotel Dublin Park West is located within the award winning Park West Business Campus in Dublin 12, Ireland. It is close to the city and all the major road networks, the hotel is one of the perfect location when considering places to stay in Dublin city west. Hotel offers FREE shuttle bus into central Dublin at weekends. Aspect hotel offers 146 bright and modern bedrooms, decorated in cool, calm tones with free Wi-Fi internet access. Relax in front of the TV with excellent choice of cable channels or refresh in the large bathroom. It also offers Self-Catering Apartment which they are brand new serviced apartments with premium design and decor and plenty of facilities. Rueben's Restaurant at the hotel offers first class food in a relaxed ambiance, with a focus on good value for money and great service. Rueben's Bar is the perfect spot to sit back and relax, enjoy a caffee or drink while catching the latest news or watch the matches on the large screen TVs. A great place to stay in Dublin west with free shuttle bus services at weekends you are most comfortable to wath and support your favourite sport team in action in places such as, Aviva Stadium and Croke Park. At the lobby bar in Aspect hotel all major sports are televised via SKY Sports. The Énergie Fitness Club is an ideal way to unwind after a busy day in the office, the centre is less than 5 minutes walk from the Aspect Hotel Park West. The hotel guests enjoy special discounted entry. Aspect Hotel Park West is an ideal choice for all forms of conference, meetings, training sessions, product launch or presentations.